Walsall manager Dean Smith says that Tom Bradshaw will not be affected by his international call-up by Wales. The nine-goal top scorer was invited to report for duty by Wales manager Chris Coleman for this Friday's friendly against The Netherlands in Cardiff. "It will be great experience for Tom," Saddlers boss Smith told BBC WM. "It'll be like when Northern Ireland called up Will Grigg. He'll learn a lot and the one thing you know is that his attitude and application won't change." Smith added: "It's an an opportunity to show what he's about on a bigger stage which is what all players want. And it's nice that we're getting our recognition for our players for what they're doing that always pleasing." Bradshaw's call-up comes at a time when he has not scored in five games - and has not scored from open play in over 800 minutes of football, his only goal in that time being a penalty against Burton Albion. He has only endured one worse run since joining the Saddlers when he went two months without a goal in seven games earlier this year. But Walsall's scoring potential has not dried up and, in fact, Saddlers boss Dean Smith is actually privately pleased that the goals are being spread about a bit. "I'm really pleased for him," said Smith. "It comes at a time when he's not been banging the goals in as regularly. But I expected it. "It's warranted. His record since he's been here has been very good. He's got better for us as an all-round player. His hold-up play, his work rate and the tactical side. It's all got better. "With them having a friendly and having already qualified, it gives them a chance to look at some of the ones who have been on the periphery and Tom's certainly been one of them." 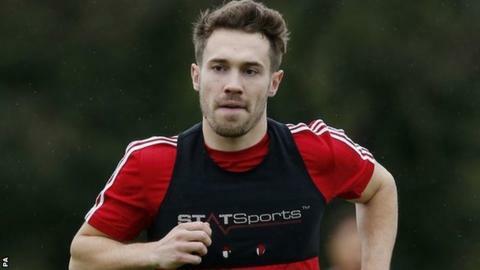 Tom Bradshaw's call-up, along with Philippines goalkeeper Neil Etheridge and St Kitts & Nevis winger Romaine Sawyers, caused the postponement of Saturday's scheduled League One game at Shrewsbury. Second-placed Burton Albion, managed by Jimmy Floyd Hasselbaink, have also had their game with Millwall called off as the Lions are expecting to have at least three players summoned for international duty. But it will give both the two sides immediately behind them, Gillingham and Coventry City, the chance to leapfrog their way into the top two. "It stalls the momentum a little bit as we're doing really well at the moment," Walsall boss Smith told BBC WM. "I saw Jimmy Floyd Hasselbaink's comments about the international window. And I agree with him that every game should be off. "We lost a couple when we played Bury and Morecambe earlier in the season. Now we've got four available for international duty, as I was expecting Jason Demetriou to be away with Cyprus too, so it shouldn't happen again."